I revisited a painting done a few years back and at the time I like the background, but when I looked at it again recently I felt it was too vibrant. I initially was going to repaint the background a dark green, but instead went with a lighter green for a more peaceful feeling. Had started this study a couple of weeks back but never finished it. I've been focused on four back to back commissions for the past few weeks s had to put it aside. 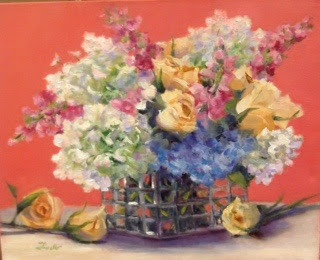 Today I had a chance to revisit the start of the painting and to just have fun playing with the shapes and vibrant colors of this collection of flowers. 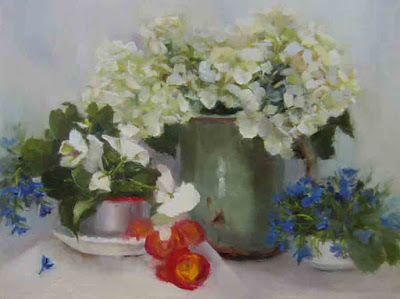 Below is the original set up, which I began painting from life, but needed to finish from a photo reference I had taken while the flowers were still alive. Wanted to feel like it was a vignette, peaking into a garden rather than a table top set up, so modified the surroundings. Blog update: You may be aware of rumors that Feedburner is going to go away. That is the service that you signed up with to receive this blog in your email box whenever new posts are added. In anticipation of the elimination of Feedburner, I have changed distribution of this blog to Mailchimp. The transition should be seamless( if I set it up properly. I'm holding my breath on this first post since the transition), but if you notice anything odd or if there is an interruption in service, please let me know by leaving a comment. Thank you! Had the opportunity to paint this beautiful bouquet for some newlyweds. The bride and groom had received one of my gift certificates as a gift from one of their wedding guests. 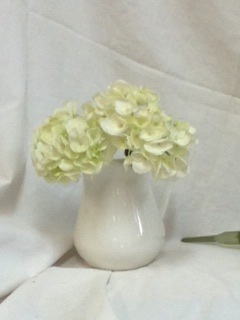 We looked at several views of the bouquet in different photos. 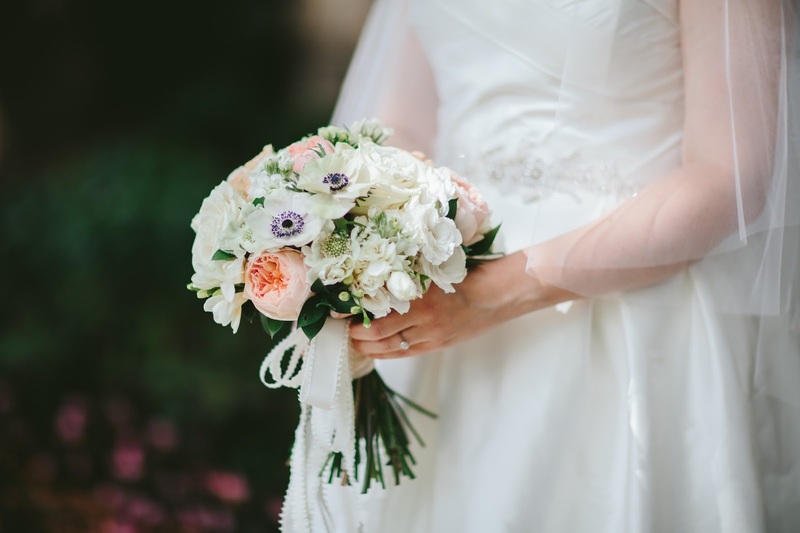 The bride especially loved the anemones, so we chose a viewpoint that featured them as a focal point. With the photo as inspiration and some artistic license, created "Betsy's Bouquet" shown above. Recently had the honor of attending the wedding of one of my long-time painting students. It was a joyful day filled with beauty, love, family and friends. 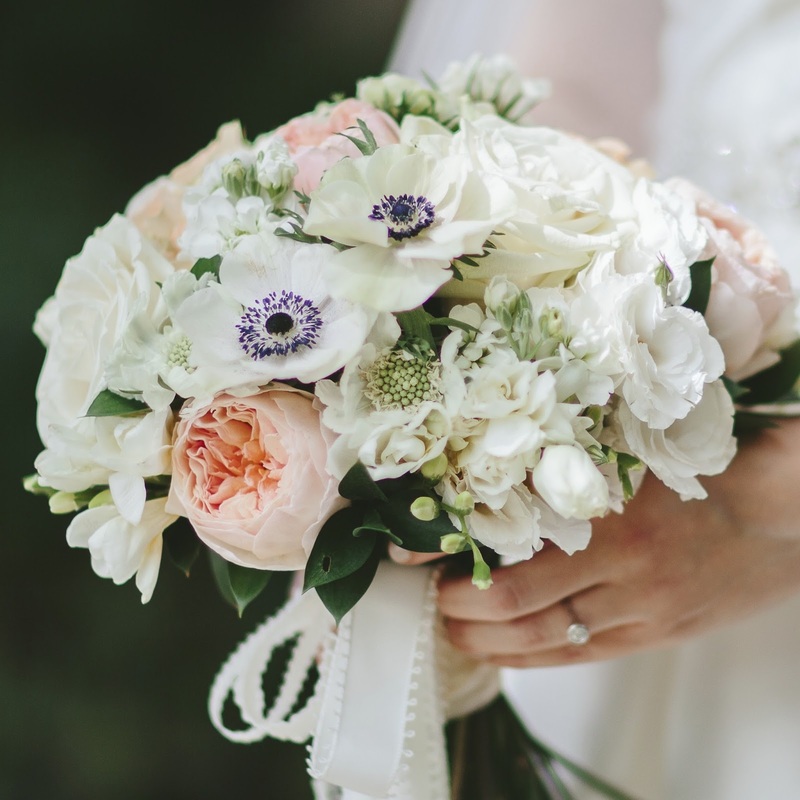 Nancy's beautiful flowers were created by Event Savvy Atlanta. 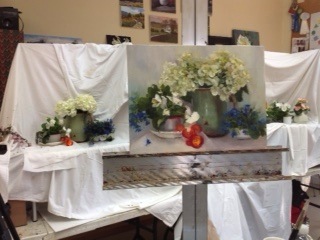 I painted her bouquet above and one of the centerpieces (below). 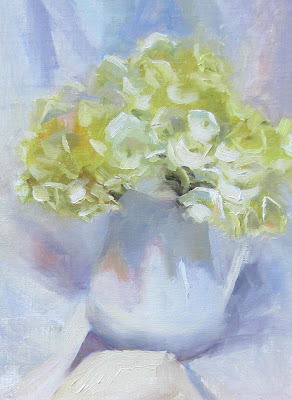 Had the challenge of painting white subject on white background and noticing the subtle shifts of color which I exaggerated in the painted version. The set up is below. It was challenging, but a good exercise that I plan continue exploring. 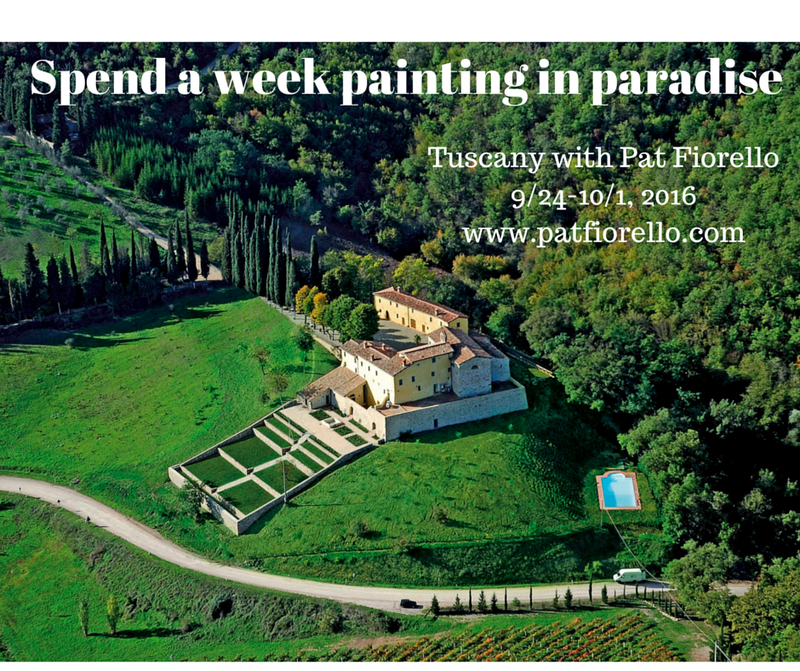 If you are ready for some fun, why not join me on a wonderful painting trip to Italy, September 24- Oct. 1. Painted from a still life set up of hydrangeas, pansies, begonias and not sure of the blue flowers (maybe campanula? ). 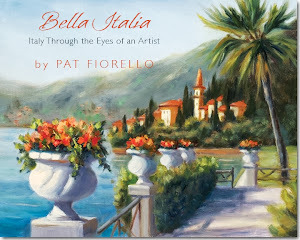 One of my favorite things to do as an artist is to create art that is meaningful and makes a difference to someone. 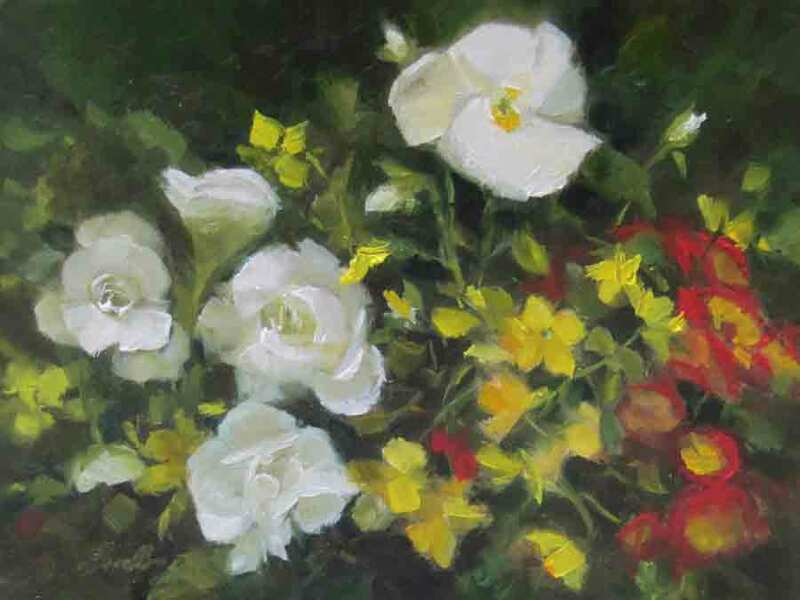 The painting above, Dessie's Day, was a painting commissioned by a mother of the bride as a birthday gift to her daughter who was married several months earlier. It is a lot of fun to plan a surprise for someone, especially when it is something as meaningful and memorable as a remembrance of one of the most important days in their life. 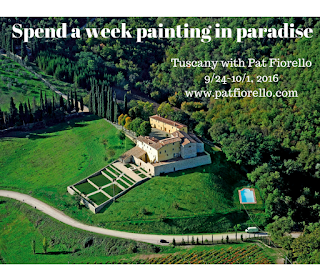 If you are interested in having a special painting created for your home, office or as a gift for someone important to you, please contact me for a free design session to explore what's possible. 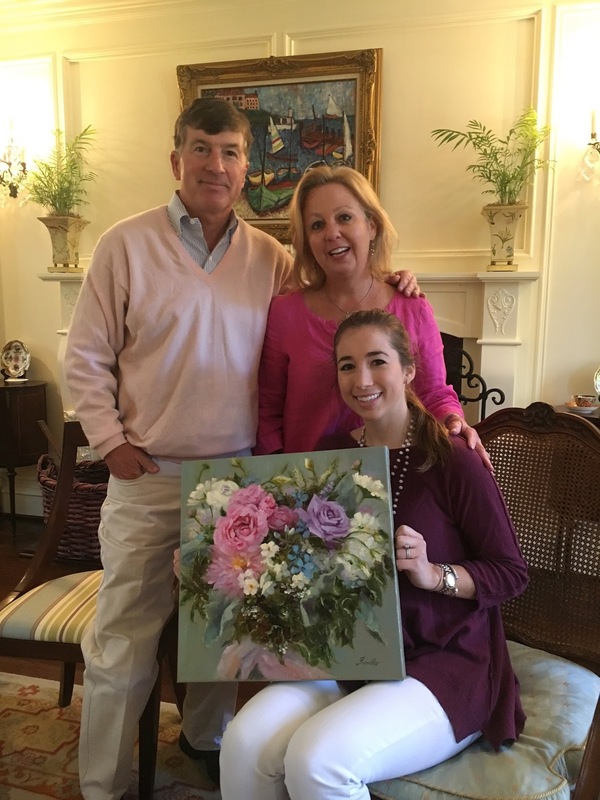 Mom and dad surprised Dessie with a painting for her birthday. A wedding day photo served as inspiration for the painting.